The four heraldic animals mean good luck decoration in a set of four spiritual creatures. In ancient time, these four spiritual creatures sumbolize four guardian of cardinal directions (north, southm east and west). 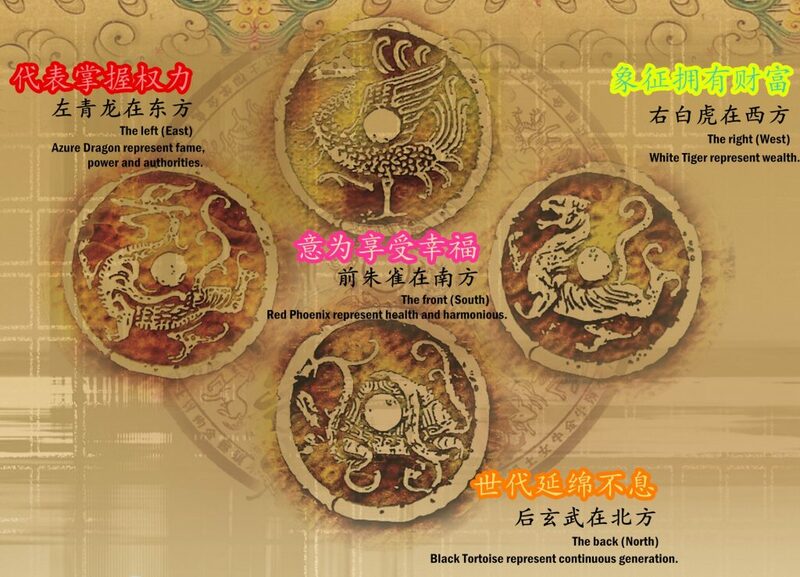 They are the Azure Dragon (Qing Long), White Tiger (Bai Hu), Red Phoenix (Zhu Que) and Black Tortoise (Xuan Wu). These four mascots are widely adored and loved by people. These four creatures are being crafted into decorative items and accessories that are being worm by people as a guardian to avoid evil spirit. In the ancient times, this four creatures, dragon, tiger, phoenix and turtle (Qing Long, Bai Hu, Zhu Que, Xuan Wu) are being used as four cardinal directions, north, south, east and west, symbolize harmonious and prosperities. These four cretures, the Red Phoenix (Zhu Que) which is in the front, resides in the south, the Black Tortoise (Xuan Wu) at the back position in the north, Azure Dragon (Qing Long) at the left is over the east and the White Tiger (Bai Hu) at the right rules over the west represent front, back, left and right direction of each guardian. Natural crystal can create magnetic field energy and may also transform bad thing into good wealth luck while the four creatures could avoid bad event. When both are combined together, it may produce a more powerful protection, drives out unlucky energy nd transfer it into good luck. 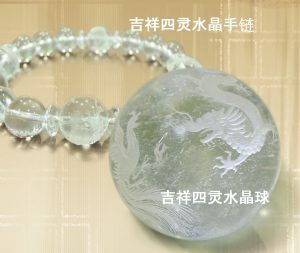 The four creature’s crystal not only keeps away disaster but may also invite wealth and harmonious environment. These four creatures when by your side, everything will be smooth, wealthy and peaceful forever.